Home RV Electricity RV Electricity – Why did my shore power plug neutral burn up? Our surge suppressor failed, and when we unplugged the 50-amp cable, we found this. Our cord was hot to the touch. What could have caused this? Could we have somehow caused it? We do have a new suppressor and power cord! See the attached picture (below right). I have a pretty good idea what caused this, and no, it wasn’t your fault. Let’s take a close look at the picture you sent to diagnose exactly what got hot, and that will allow us to determine just how it could have happened. Take a look at the picture on the right. As always, you can click on any picture to enlarge it for a better view. You’ll notice there are four wires on your 50-amp shore power plug. I’ve labeled them as Hot 1, Hot 2, Neutral and Ground. You can clearly see that the overheating occurred on the Neutral contact at the bottom of the picture, and it began to melt the rubber insulation – which is very dangerous. But in reality, the Neutral contact is not to blame. It’s simply the victim of a pair of misbehaving Hot 1 and Hot 2 connections. Let’s see why that is. If you take a look at my diagram on the left, you’ll see that the campground pedestal (and all NEMA 14-50 outlets in general) are supposed to be wired so that Hot 1 and Hot 2 are connected to two different legs (poles) on the incoming power transformer from the power company. And that’s the reason we can get 120 volts by connecting an appliance between the neutral and either Hot 1 or Hot 2. You can also see from the diagram that connecting any appliance between the Hot 1 and Hot 2 contacts will result in 240 volts, which is how your home electric water heater and oven are wired. However, very few RVs actually use 240-volt power for anything, so their appliances are divided up between the two Hot Legs of 50 amps each. And that’s why a 50-amp RV connector can supply a total of 100 amps of current: It has 50 amps of current available on each 120-volt leg and 50 + 50 = 100 amps. It’s simple addition. The hat trick is that when this 50-amp connector is fed by two different legs (poles) the current in the neutral subtracts rather than adds. So if you’re drawing 40 amps of current on the Hot 1 leg, and perhaps 30 amps of current on the Hot 2 leg, then instead of the expected 70 amps of current on the neutral (40 + 30 = 70), you only have 10 amps of current on the neutral (40 – 30 = 10). And that’s why the neutral wire and contacts in your shore power cord are sized to handle a maximum of 50 amps of current rather than 100 amps of current. If you force a 50-amp rated wire and connector to carry 70, 80 or 90 amperes of current, then it will overheat and eventually burn up. What causes this? It’s non-code compliant wiring at the campground. 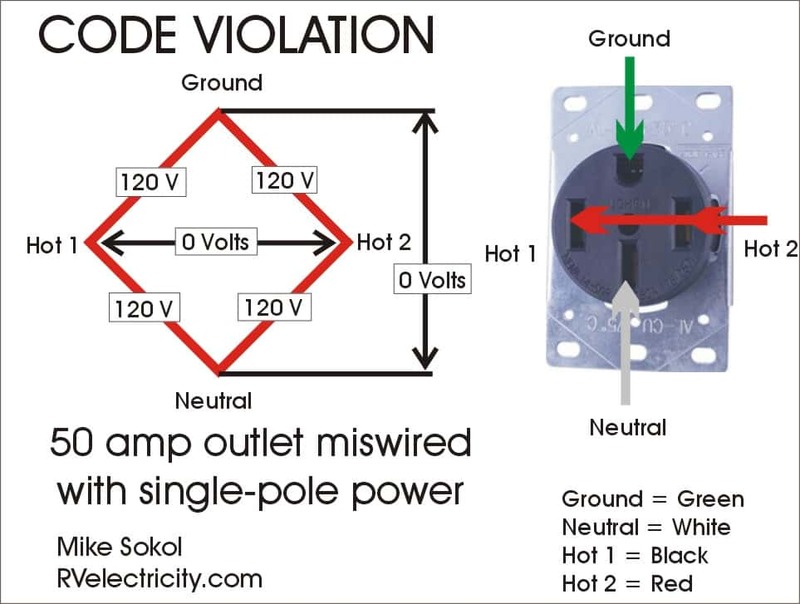 Instead of running two separate wires (poles) of 50 amps each, they simply jumped a single pole (wire) of power to the Hot 1 and Hot 2 contacts on the pedestal outlet. They probably did this to save money by not rerunning a 4th wire when they upgraded to newer 50-amp pedestals from older 30-amp pedestals. 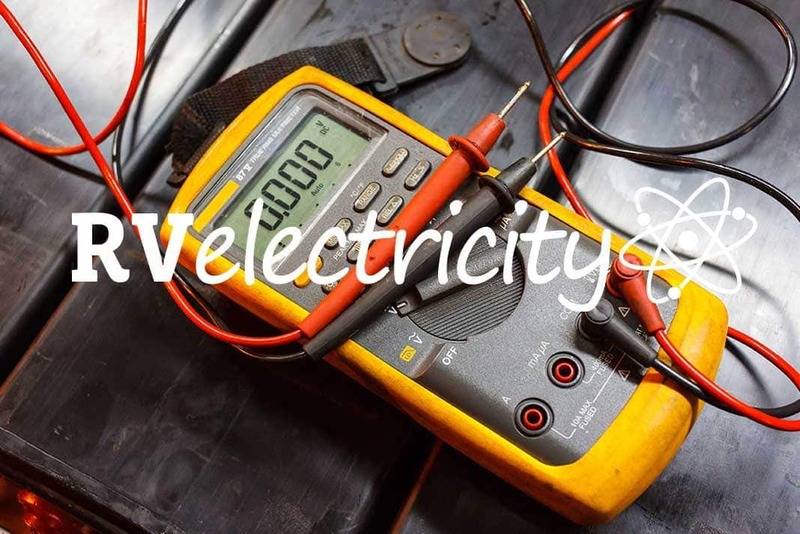 And while your RV appliances will function normally because they only need 120 volts (not 240 volts like your home appliances), you won’t know that the neutral is being overloaded with up to 100 amps of current until it’s too late. This is a clear code violation that should have been caught during electrical inspection. Problem is, campground wiring is almost NEVER inspected, which is why you need to protect yourself from this sort of miswiring. So here is a solution to protect your RV wiring from this kind of assault. The latest line of 50-amp surge protectors from Surge Guard actually monitor the neutral wire for excessive amperage draw and will shut power down if the current exceeds 70 amps. And that should prevent your neutral connectors and wiring from burning up if you happen to plug into a miswired pedestal with a single-pole 50-amp outlet. 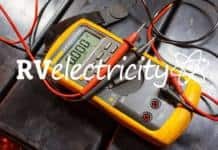 I’ll note that you should also inspect the neutral wire inside of your RV where it connects into your circuit breaker panel to make sure it hasn’t overheated there as well. You want to make sure your neutral wire hasn’t been overheated inside of your RV because an open neutral will cause all sorts of very bad things to happen. I’ll write about what happens if your 50-amp shore power neutral becomes compromised in a future article, but for now lets just say it’s a very expensive failure. I’ll be presenting my first Advanced RV Electricity Seminar on June 8th in Funkstown, MD. There will be a 1 hr Basic RV Electricity seminar starting at 10:30am, followed by a 3 hr Advanced RV Electrical Troubleshooting seminar beginning at 1PM. Cost is $30/$20 for the Basic seminar and $125/$100 for the Advanced seminar. RVtravel Member/Readers get the discounted price. For more information on seminar content and to pre-register, please click HERE. For the entire list of all RV Electricity Seminars I have scheduled this summer, please click HERE. See you next week. In the meantime, let’s play safe out there…. Next articleMy grandfather and me: both authors! People use to restart a dead battery . Could this reduce generator run time while boondockimg ? I’m not sure that replacing a pedestal outlet “in the dark of night” is a good idea since anything going wrong with that pedestal later could possibly be traced back to you. And I simply won’t perform electrical work in a district that I’m not licensed, since there’s too much liability for my taste. So while you’re doing something with the best of intentions, I would rather see the campground replace these worn outlets themselves. And that’s a difficult thing to do. I have a pair of digital panel meters that display the voltage and current draw for each leg of my 120/240 VAC 50 A service. These are mounted where they are readily visible from the kitchen area of our 5th Wheel. When we are plugged into 120 VAC 30 A service I can switch one meter over to read that voltage & current draw. I made it up myself as I’m an electrician. Very handy and we’ve not pulled a post breaker for several years now when plugged into 30 A. Unless you also monitor the voltage from leg-to-leg, then you won’t know if you’re on in-phase or out-of-phase legs. But depending on where you’ve installed your current transformers, you may or may not be reading the total neutral current. Just reading the individual pole currents won’t work for this. Wouldn’t similar potentially happen with a “50A RV down to 30A plug” dogbone? I believe these just connect both 50A hots to the 30A hot. You’d be relying on the pedestal 30A breaker to stop your potential 100A@120 draw still allowed by the RV breakers. Since you can’t get more than 30 amps out of a TT-30 receptacle, you’ll never overload the neutral which is rated for 50 amps of current. Since these pedestals have a pair of 50 amp circuit breakers for the 50-amp/240-volt outlet they can actually combine the two currents to provide up to 100 amps on the neutral. Mike. Does the same thing happen on a 30 amp plug. Please explain why one leg on my plug burned. Not the same double loading issue. More likely you had dirty/damaged terminals on your plug or inside the pedestal, which raised resistance and caused heating. No, there’s no combining of currents in a 30-amp outlet. What you’re describing is typically caused by corroded or loose contacts in the pedestal or shore power plug. Mike: Thanks for the excellent info on RV electrical safety. It has been extremely helpful, including your excellent book on that topic! You noted that “The latest line of 50-amp surge protectors from Surge Guard actually monitor the neutral wire for excessive amperage draw and will shut power down if the current exceeds 70 amps.” Does the Progressive Industry’s EMS-HW50C do the same? I would like to get a surge protector that will also protect against this. Doesn’t sound impossible to me… much like GFCIs are much simpler inside than most people think they are. I was once told my own all in one pedestal testers are “impossible,” so maybe I just know more tricks? Wolfe, that’s because you don’t understand the difficulty involved in determining the voltage 100 ft downstream of the actual measuring device. Hint: There is no way to do this directly. I have been trying to contact you directly, but DO NOT have a Good Email to do so. I have an Idea I’d like to run past you and get your opinion on! Please provide me with a good contact Email. In my new rv the surge protector is inside the rv behind a removable panel. Should it be at the pedestal or at least in the compartment where the cord enters the rv? Harry, It can be located anywhere and still protect your RV’s electrical system. However, the portable versions are great for checking the campground pedestal power BEFORE you pull into the spot and start making camp. But another thing to consider is that the aftermarket versions possibly offer a lot more protection than something the manufacturer of your RV may have installed.